Do you often use navigation in Locus? Now will be your life with Locus easier. App remembers your last end points or whole navigation route. So you can very quickly define navigation route. You can also improve computing of navigation route. 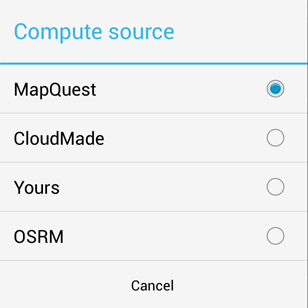 Locus supports high-performance OSRM rng engine which works with free data from OpenStreetMap. New version comes with improved TTS (Test To Speech) manager and positive news for Locus free users. TTS function is now available in both Free and Pro versions. Locus keeps in mind users which manage thousands of caches. Icons of points will become smaller, when you zoom-out. You get better overview because you can see position of points and also the map in the background. Listing tab in geocaching screen has improved HTML viewer and for this reason it’s possible to swipe between tabs in this screen. As you probably know Locus supports for example export to the KML or GPX format. Now you can export your data to the simple CSV format. This can be useful for following data processing. Supported is also Garmin TCX format for exporting recorded tracks. For advanced users can be also useful new lines tools which give possibility to compute intersection two lines.